As the economy rebounded from the Great Recession, the Idaho Transportation Department was faced with a dual challenge: retain employees getting high-paying opportunities in the private sector while improving their services. State employees are paid, in part, based on the number of employees they supervise. With fewer supervisory roles, there were fewer opportunities for career development. So, in lieu of traditional vertical career paths, ITD is developing horizontal ones. These Horizontal Career Paths are progressive stages employees can complete in order to receive higher compensation. Each stage is made up of several performance metrics including a team goal, personal training, skills proficiency, and meeting safety standards. 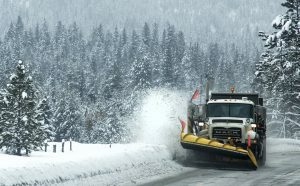 The first Horizontal Career Path was created for maintenance workers – those who plow snow in the winter and flag or repair potholes in the summer. This is not only the largest single classification for ITD, it was one of the hardest to recruit and retain. J has completed the TTO career path in three years. He took advantage of training offered for the path and learned new ways to combat snow and ice buildup on the roads. The team metric of his HCP also brought his shed’s entire crew together.